It’s been a while since I took on a good sewing project and the kids’ bathroom was calling to me. 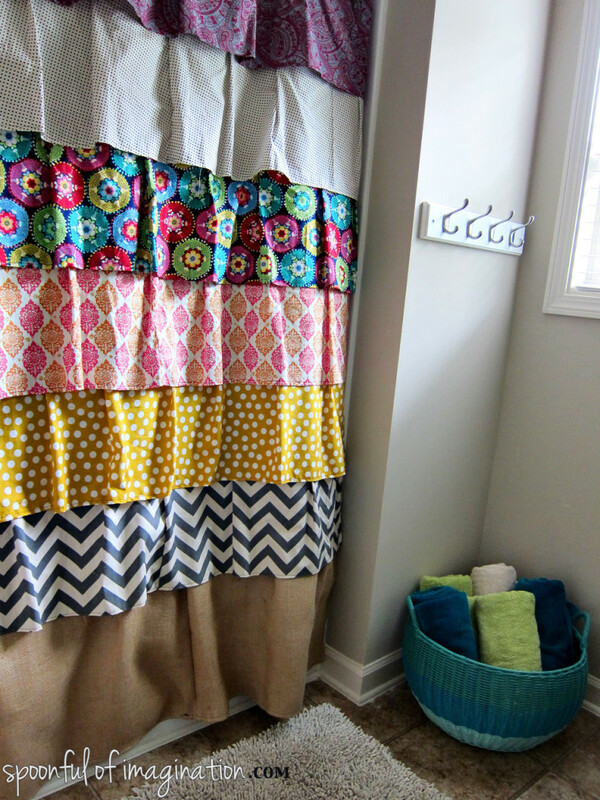 I did away with the old rubber ducky shower curtain they have had for years and created this DIY Ruffled Shower Curtain to take its place. It was relatively easy to sew. It just requires doing the same few steps over and over (for as many ruffled rows you want to create). Here is how I made mine in case you want to make it as well! 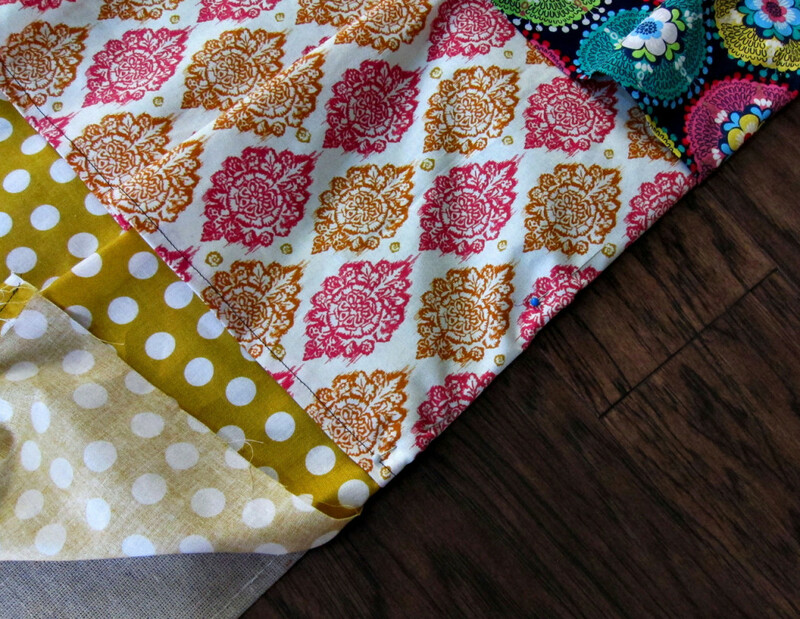 I started with gathering some fabrics together that I loved. I had some on hand, but I also went out and bought a few more to have enough fabric. 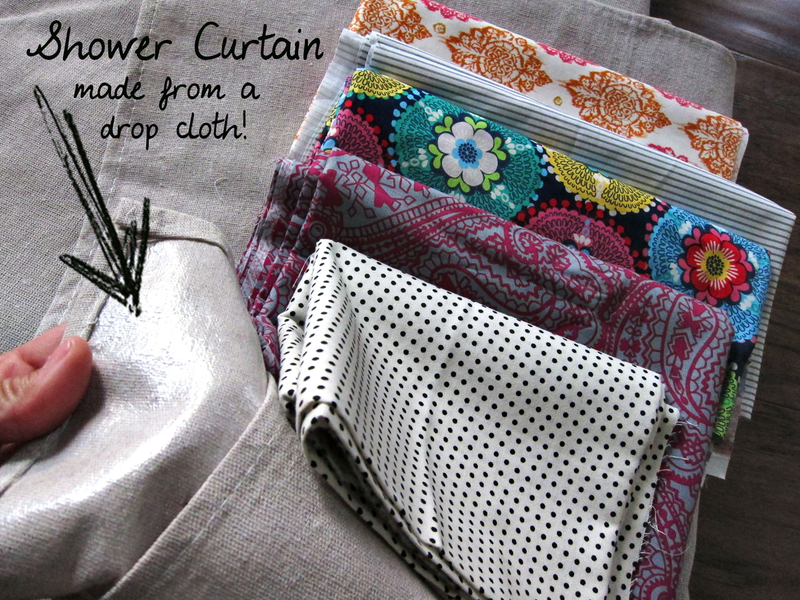 I used a painter’s drop cloth as the foundation that I sewed my fabrics onto. I love the way the drop cloth added a heaviness to this project as well as a plastic lining that I think will help it to hold up well. 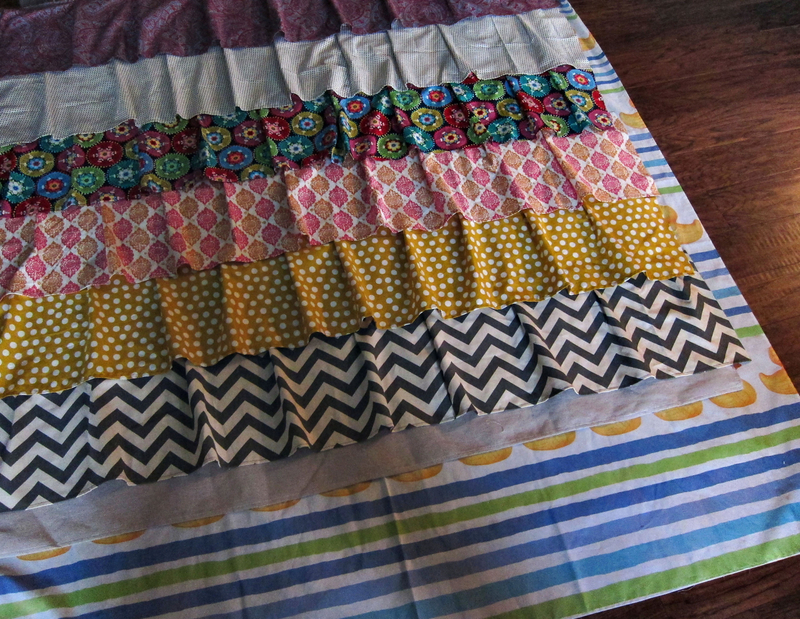 I cut all my fabrics into 12″ wide strips. I didn’t measure the actual length in inches but just sewed enough 12″ strips together to make a long strand that I could then use to ruffle up to cover the length of the drop cloth (which just so happened to measure the width of our shower stall). After all my fabric strips were cut, I ironed the edge of one side of each strip about 1/4″ up and sewed down that fold to create a nice finished edge for my strips to become ruffles. I then folded and pinned my fabric in a way much like I did on my ruffled fabric bag to create ruffles. I simply sewed down the line of pins to attache the ruffles to my drop cloth. Make sure you are not sewing along the edge of your strip you just hemmed. You want that neat, pretty side to stick out and show. This was the start of my shower curtain coming together. 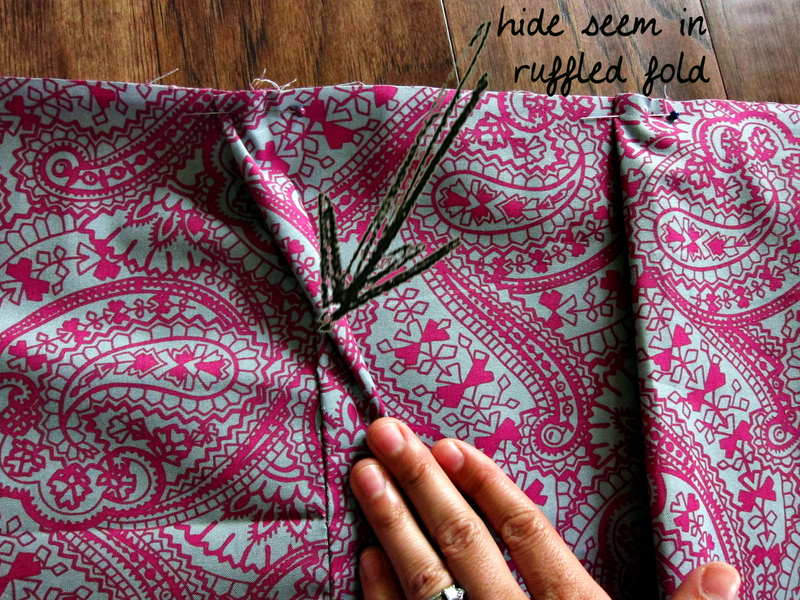 Note: if you have any seems you want to try to hide, space your ruffles so they get hidden in the center. 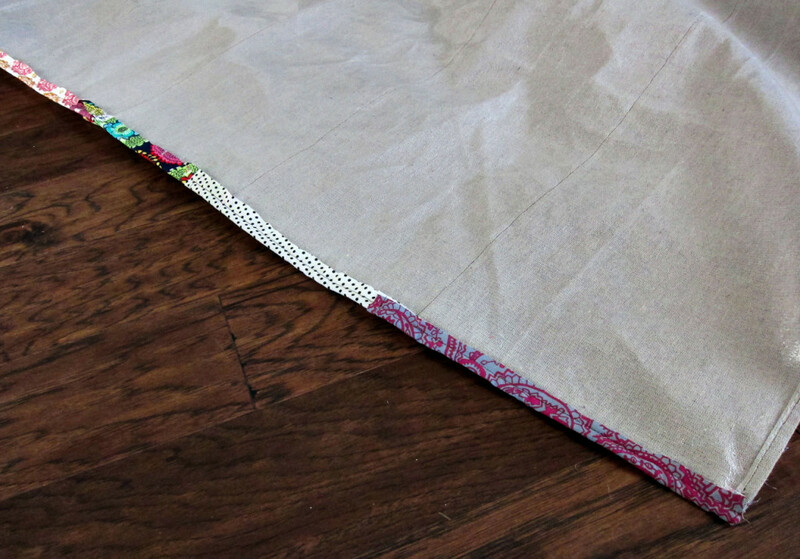 After I had the first ruffled row sewn on, I drew small little lines where the edge of the ruffle laid on my drop cloth. I then pinned a row of pins two inches above those penned line marks. 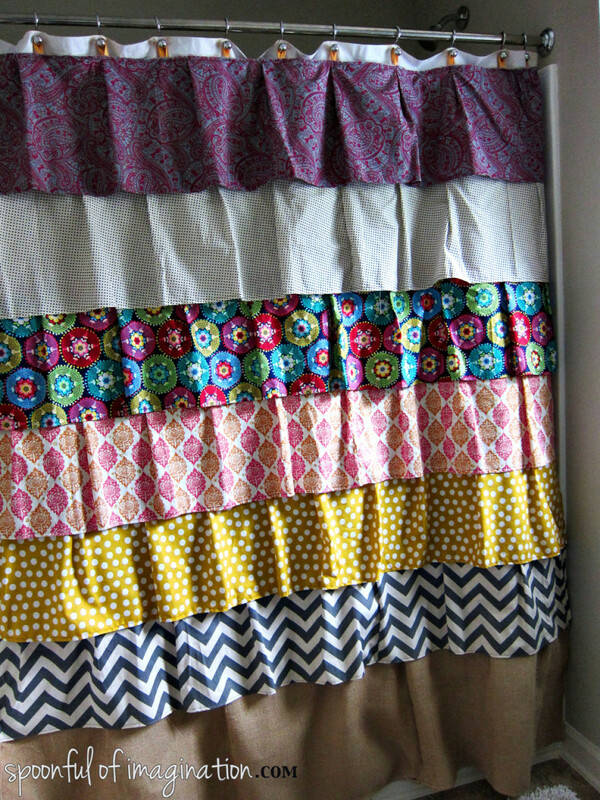 I wanted my ruffles to overlap a good bit, and this two-inch space created that. I then simply picked up each pin and pinned it right back down to hold the next ruffle in place. After that whole ruffled row was pinned, I sewed it. 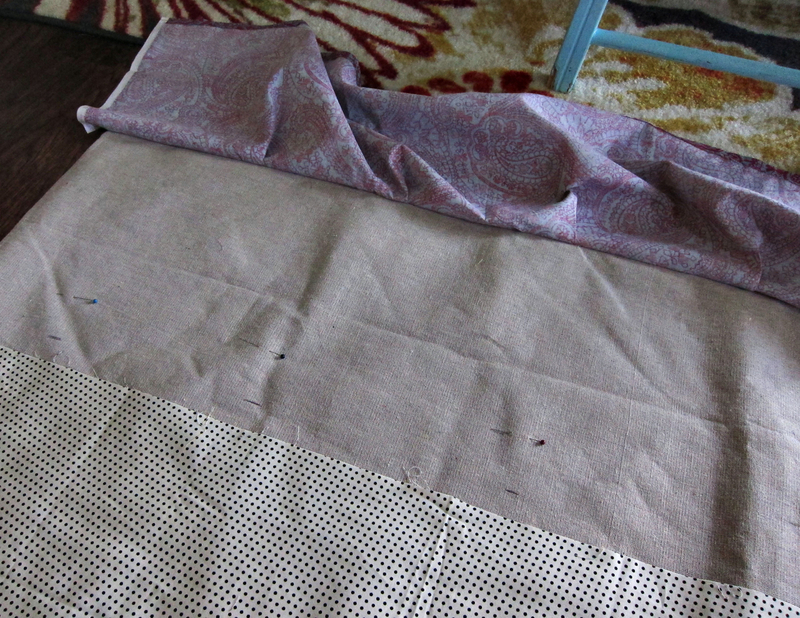 I then started this process back over until all my fabric rows were complete. At the end of my fabric ruffles, I saw I had a small margin of drop cloth to still cover and my new shower curtain was way shorter than my old shower curtain (when laid on top). 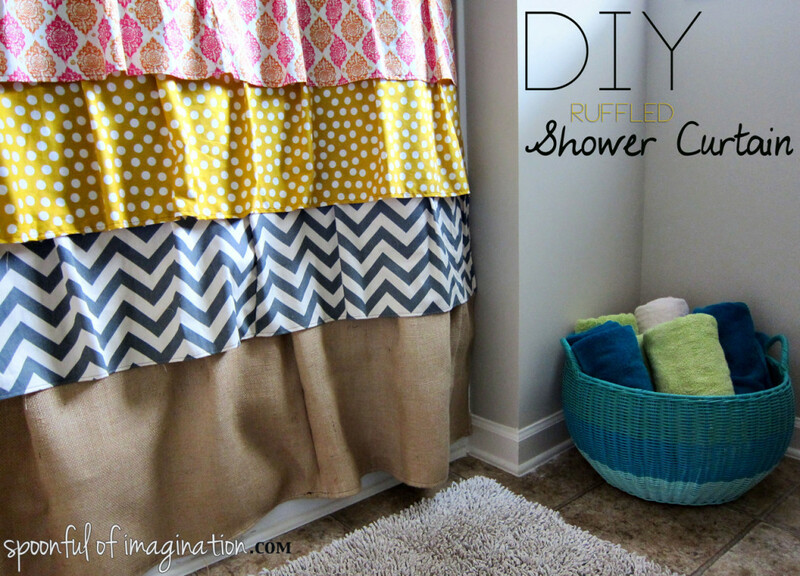 I decided to line burlap and create a ruffle using that for the bottom of my shower curtain. I decided that the contrast in fabrics would look good, especially since this last ruffled row measures more like 17″ than my 12″ fabric ruffled rows. Once the burlap ruffle was attached, I folded all my fabrics over the edge to wrap around the drop cloth, and I sewed down the side. This step created a finished side and now prevents any of the ruffles from completely flying up. I then turned the shower curtain over and trimmed all the back pieces off to make the inside look clean and finished; although, I will still use a cheap plastic shower curtain to hang with this decorative shower curtain. I couldn’t decide if I wanted to create loops, make eye holes, or sew my new shower curtain onto an old one to create the eyelet holes at the top in order to be able to hang it. I think I will go back and create the eyelet holes, but for now I was afraid I would ruin it, if I was to try that. I am a lazy sewer and don’t like changing the foot on my machine. 🙂 I simply folded some ribbon over to create a double thick loop that I sewed onto the top of my shower curtain. These could be easily removed later down the road, if I get brave enough to try the eyelet holes, but they work for now. I love the way it came out! 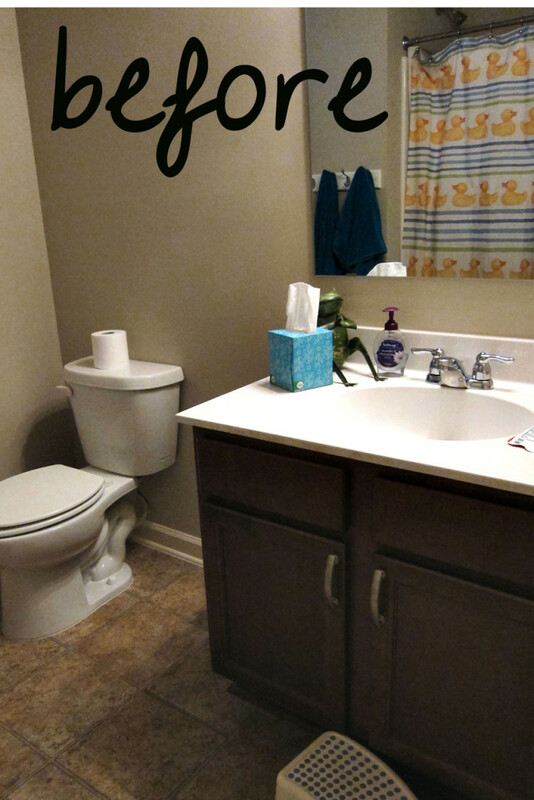 I have some fun art and other accessories that I am working on using in this bathroom, but the space already feels so much different with the new shower curtain. I love the way these fabrics look together. I used some of my scraps to sew two embroidered hoops. I would like to give them away to one of you! Simply, let the rafflecopter widget load below the picture, and enter as many ways as you want! 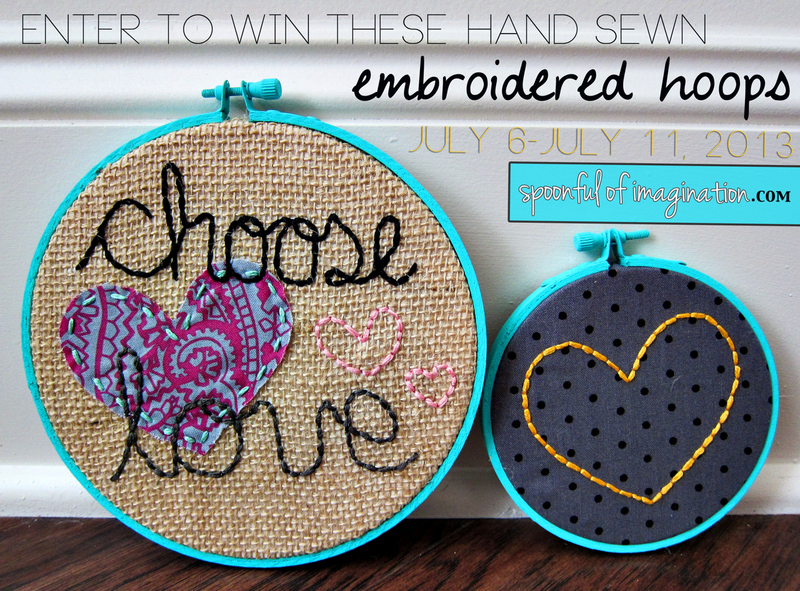 I will announce the winner right here on Friday, July 12, 2013. I hope you had a great Independence Day and are enjoying this weekend! 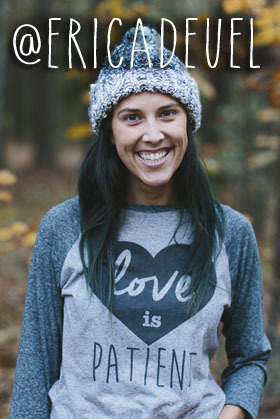 I am IN LOVE with your blog and all things you make!!! 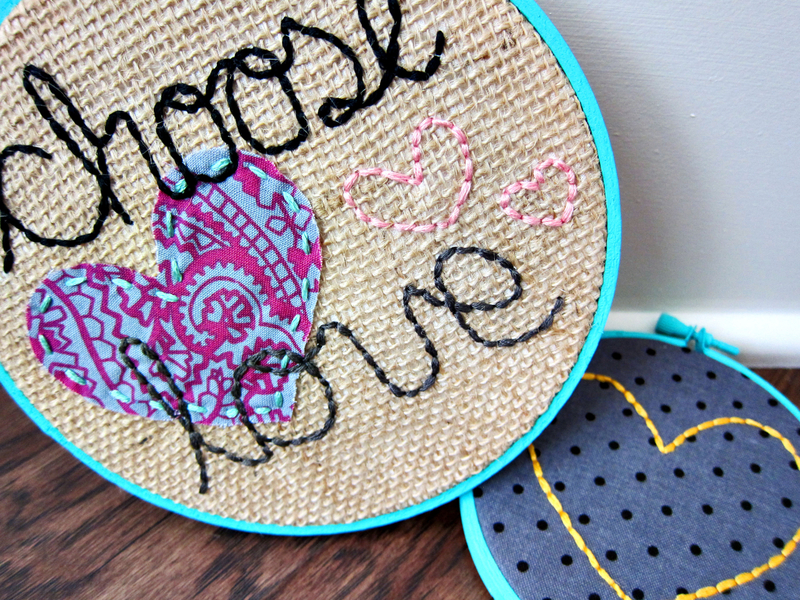 I would SO LOVE one of your hoops to hang in my house! You INSPIRE me!!! I am not a crafty mom but I try! 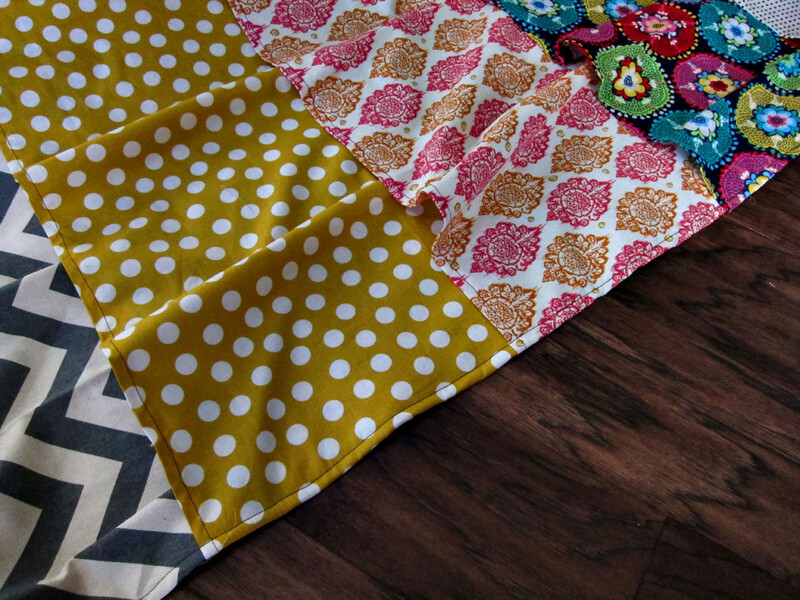 I had a friend make me a quilt for my bed after I saw yours and NOW I am having her make me a shower curtain like yours! Please keep your ideas coming. YOU ARE AWESOME! For sure one my favorite blogs ever! the shower curtain turned out awesome!!! i want to try one..